That’s how civil servants like their emails. Our first few mailings were aimed at obvious targets – e.g. senior leaders highlighting a new course on change leadership, with another group being offered 100 free places as an incentive to find out more. We had some great feedback from the pilot courses and used quotes in the emails from named staff to help recipients feel connected. What a brilliant brainstorm of yours. I will certainly put time in my calendar to go through a few of the topics. We had responses from 4% of SCS, compared to an industry average of 3.4%, and the free places all went within 4 hours of the email going out. But we were still novices, so we sent one of the team on a 2-day Institute of Direct Marketing course. She came back buzzing with ideas, which she shared across CSL and with Cabinet Office comms colleagues working on the all-staff email Civil Service News. The trainers repeatedly stressed that you have to make your email content relevant to the recipient. those in operational delivery roles - qualifications-based packages specific to their profession. 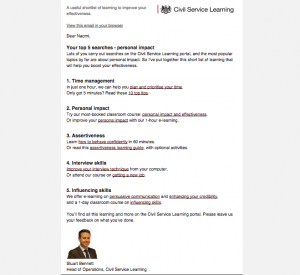 We used the information that people provide when registering on the CSL portal to help us focus the content and messaging. The next thing we tried produced perhaps the most surprising result. We decided on a more personal approach, signing the email from a CSL team member and including a photograph. Open rates and click-throughs increased significantly. We also tried sending half a mailing from a male team member and the other half from a female, to see if gender made any difference – it didn’t – but the team enjoyed running a sweepstake on who would win the battle of sexes! And when we tested a traditional subject line against something more quirky, we found that civil servants preferred the traditional one. It’s not all been plain sailing. For the first 6 months, we had to agree not to activate the ‘click-through’ function in the mailing system. This meant that, although we could see how many people opened the emails, we had no reliable way of knowing if they took any action. Now, with IT teams reassured that we won’t compromise the entire government mailing system, click-throughs are enabled and we can see which calls to action are most popular. Evaluation has been crucial in convincing people of the importance of direct mail in our campaign to encourage people to use their ‘5 a year’. Open and click-through rates have grown as we have become more experienced at identifying relevant content and segmenting groups by behaviour, rather than just demographics. This was most clearly demonstrated when we mailed a target group who had done a particular classroom course to recommend five other courses. This achieved a staggering 36.1% open rate, with a 7% click-through rate. We are now looking at how we can merge separately held registration data with information on learning undertaken so we can segment our mailing in both dimensions. A number of departments are talking to us about how we might work with them to email specific learning offers to their staff; and the policy and operational delivery professions have both done personalised emails to their members and are keen to do more. Direct mail will never replace a conversation with your line manager or a colleague about the learning that’s right for you. But it can provide a nudge in the right direction and make all the difference to staff who regularly tell us that the main barrier to learning is lack of time. The direct mails are very useful and really well put together. More please!